I had a horrible experience today and hope to help save someone the frustration of going through this. I purchsed a 2016 ecodiesel brand new with the extended warranty agreement that covers 84 months 125000 miles. I now have 47000 miles on my truck and the speed sensor went out. Service department called to file a claim under the extended warranty and paperwork was never submitted when I bought the truck. I called the dealership they said its under new ownership and they didnt have the agreement. They had me call two other dealers that purcahsed the dealership to see if they could find it, after an hour on the phone trying to find it, they did. They submitted the agreement and now I'm waiting for an approval. 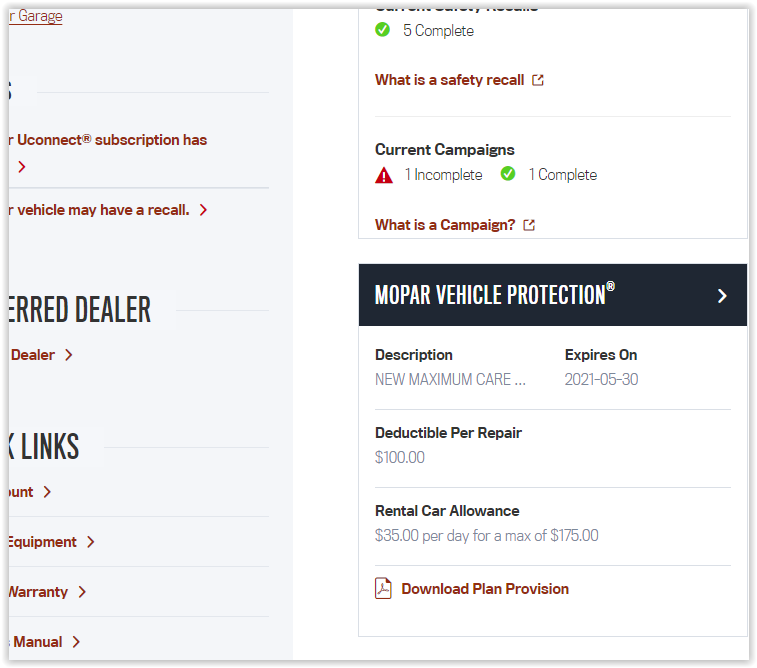 Purchasing the extended warranty requires us to follow up days after because dealerships will not submit it in hopes that you never use it and they pocket the money (I paid $2800) and in my case I was fortunate to not get swindled and or lost. Another note, agreement states you have to take the vehicle back to the dealer where you purchased it if your within 40 miles. I highly recommend the extended warranty but we must do our due diligence. Hope this helps! Last edited by ricgos; 04-10-2019 at 02:21 AM. phprof, HYDREX and redsunBC like this. Happy to hear it worked out okay. phprof, Perrysburg Dodgeboy and sourdo like this. Some place out there there is a special place in %&%$ for swindling dealerships. They don't all do it but they exist. It is a good thing for those in it that I wasn't put in charge. I got swindled by a Firestone auto repair center about 16 years ago. They "fixed" my exhaust problems on an old '86 Aries K car only to have it break a week later. When I returned they were closed up. I guess I was part of the "going out of business sale". It would be easy for an unscrupulous dealer to not submit your extended warranty application and keep the money. They'd only get caught if you tried to make a claim. I did confirm my extended warranty, but not because I thought they might cheat me. Update, now First Extended (warranty) is not approving the claim because it has to be serviced by the original dealer (99 miles from where I live). I advised the agreement states "within 40 miles of dealer must be serviced by selling dealer". First Extended replied, mileage doesn't matter and must be serviced by dealership where purchased. Wow!!! I'm waiting to hear back from the dealership and see what my next step is meanwhile I'm paying the cost for repairs out of my pocket smh because I dont have time to wait for an approval! Good to know but they sold me something else. Wish I would've paid more attention and asked for Mopar. Oh boy. I hope they pull through and yeah I was thinking it was Mopar. So you had no copy of the aftermarket warranty you bought for a huge sum? The dealer changed ownership. Another owner sorted it out. Then you did not know the fine print that said you had to deal with the original dealer? Not sure I got it right but if so, the "nightmare" you titled this has roots in your aftermarket purchase and knowledge of what you bought. This is NOT an FCA/Ram issue and should be recognized as such. Hate to see FCA/Ram condemned for something they had nothing to do with. 1. Contact state consumer affair/frauds bureau. 2. Seek conversation with the actual owner of the dealership; he/she can certainly help you (dealer error was not submitting the agreement in a timely manor within purchase date). 3. Consider litigating in small claims OR pay any attorney to draft a letter regarding misleading the consumer if you were not informed of contract stipulation. extended warranty after original extended warranty?